Koinor is a systemic, contact, suspension concentrate insecticide for the control of various pests on plants. Its active ingredient is: Imidacloprid (chloronicotinyl) 350g/ℓ. It is easily applied as a drench. It is effective! Aphids, also known as greenfly and blackfly, are sap-sucking insects found on the roses’ soft new growth throughout the growing season. They can quickly reproduce, leading to massive infestations entirely covering new red shoots if left untreated. Easily managed and causing minimal damage in small numbers, their presence is more an unsightly nuisance rather than a real threat. White cast aphid skins on infested flower buds and leaves. 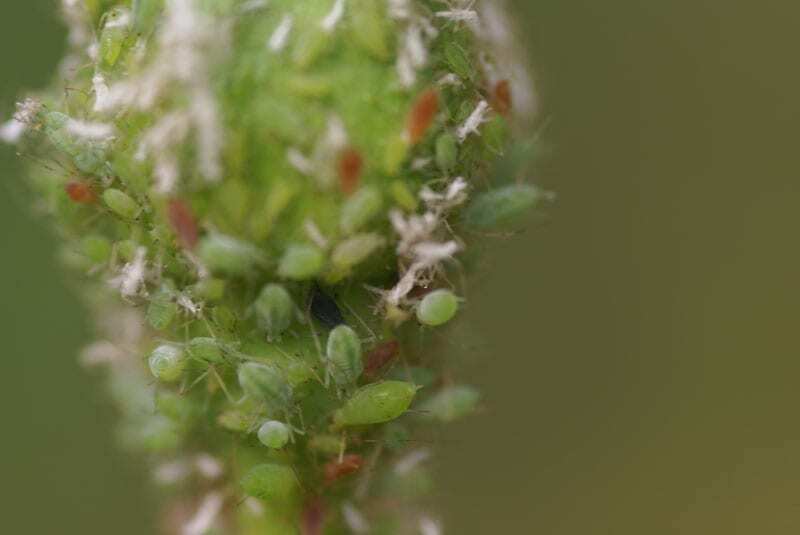 Aphids are tiny green and or pink pear-shaped insects with slender legs that live in colonies on the still developing flower buds and the underside of rose bush leaves. They belong to a group of insects known as Hemiptera -the mouth parts of which are modified to form piercing and sucking tubes. This group of insects has an incomplete metamorphosis, there being no pupal stage but a series of moults in which the nymph gradually becomes a mature adult. 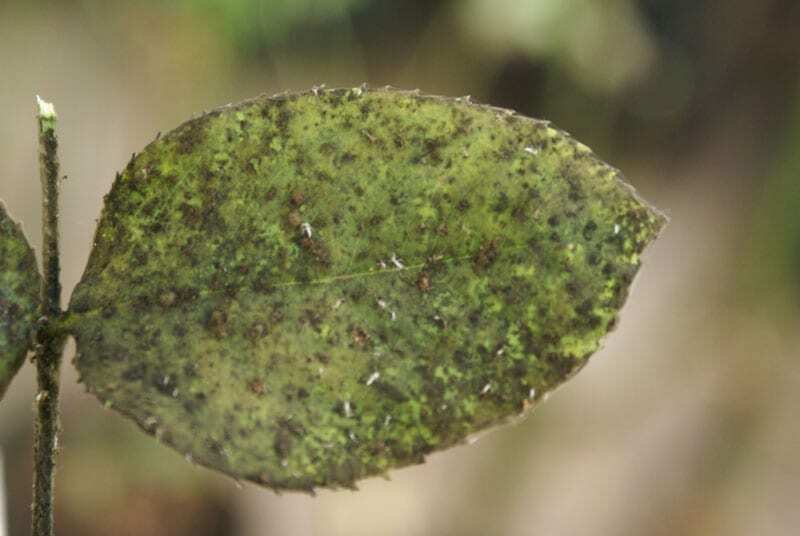 As a result white cast aphid skins are often seen on infested flower buds and leaves. Adults are usually wingless, but can develop a winged form seasonally or when populations become crowded, so that when food quality suffers, the insects can travel to other plants, reproduce, and start a new colony. Aphid soot on rose leaf. Nymphs and adults feed on rose plant juices, attacking leaves, stems, buds and flowers. Most especially, they like succulent new red purplish growth. Leaves and stems are often covered with a sticky substance called honeydew. This sugary liquid produced by the insects as waste, often attract other insects particularly ants, which gather the substance for food. The honeydew can sometimes develop a fungal growth called sooty mould, causing branches and leaves to appear black. Sooty Mould left unchecked, will greatly reduce the plants ability to photosynthesise. 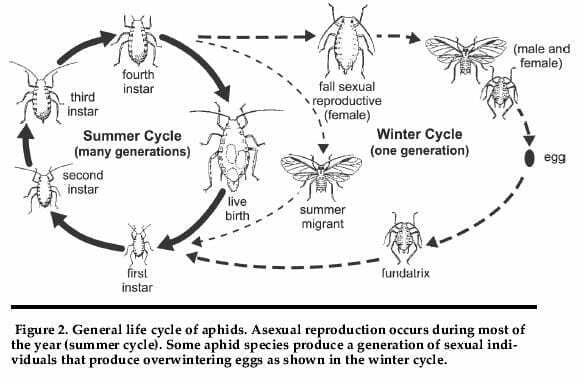 Aphid activity is influenced by the seasons in as much as the availability of food. They are more prevalent during spring and early summer simply due to the abundance of new soft plant material on which they feed. Hot dry conditions can cause an influx in their population if plants are not watered well – plant stress causes a lowered sap flow, making the sap sweeter and more palatable to aphids – as a consequence these plants are more susceptible to infestation. 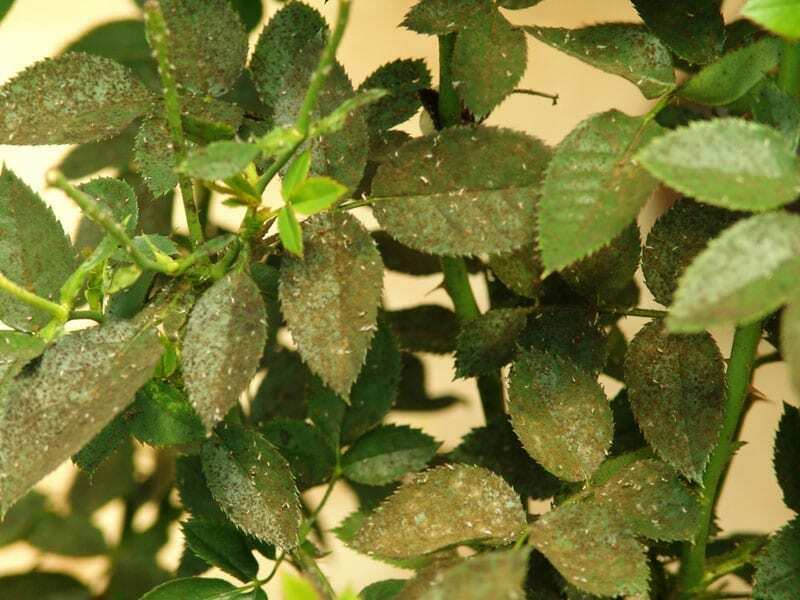 Aphids usually overwinter on roses as eggs laid on the stems during the previous autumn. However, in sheltered places where roses are not pruned there may be active nymphs and adults all year round. 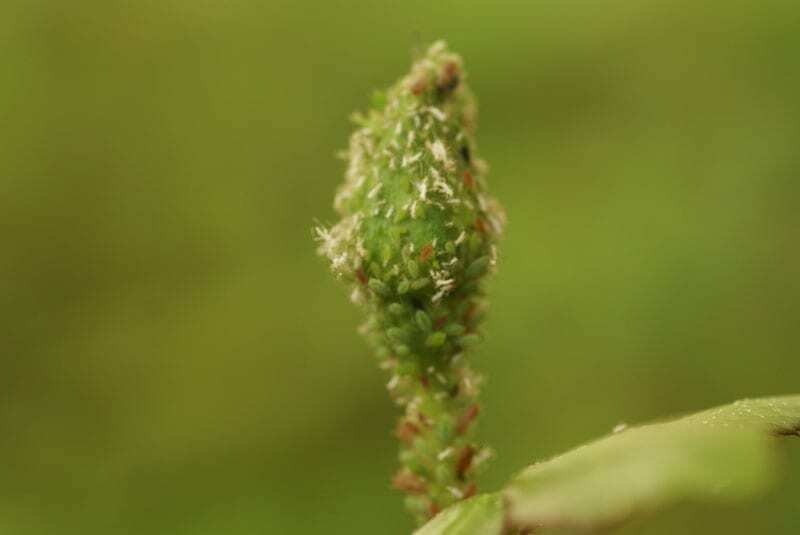 Aphid numbers start to increase in spring when roses produce new growth and reach a peak in early summer. During spring and summer, the aphids are mostly wingless forms, 2-4mm long, that give birth to live young. Aphids reproduce asexually and sexually – generally producing more female aphids throughout the season. 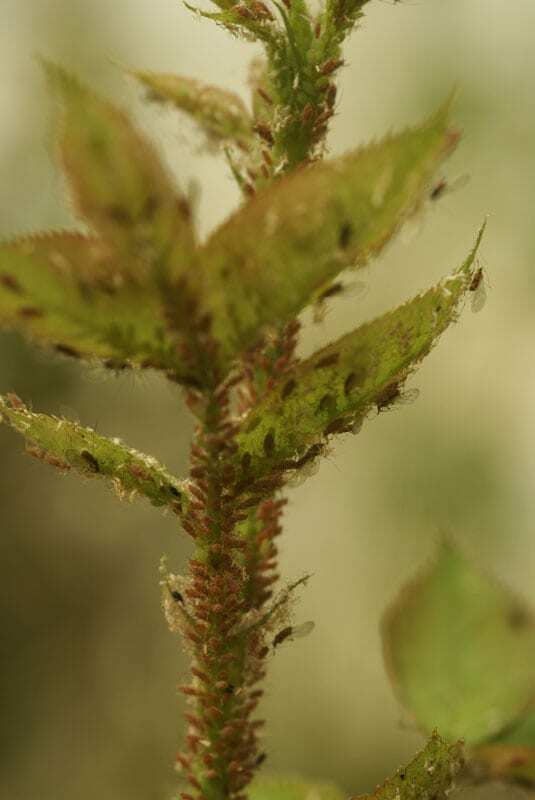 When the weather is warm, aphids can develop from new born nymph to reproducing adult in seven to eight days. 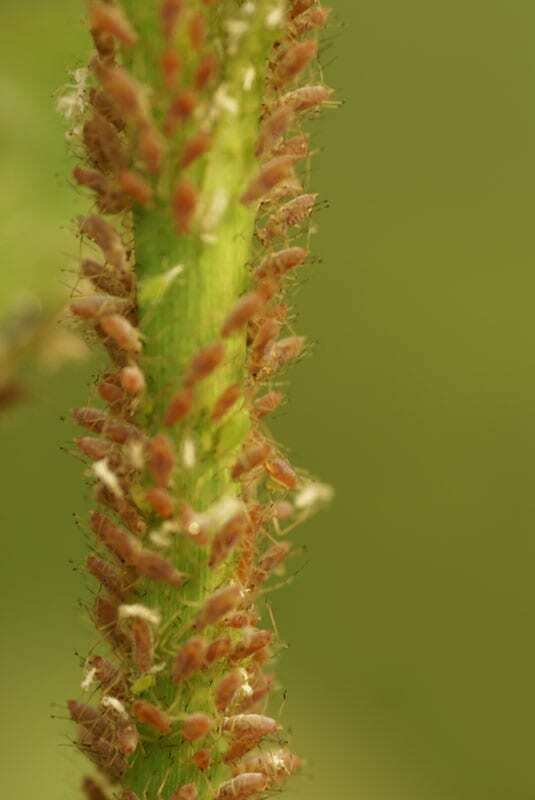 Because each adult aphid can produce up to 80 offspring in a matter of a week, aphid populations can increase with great speed if left unhindered. Since aphids feed on soft new growth, vigilance during Spring and early Summer will prove beneficial in keeping their infestation in check. Squashing the aphids with your fingers is the easiest but perhaps most gruesome way of controlling their numbers when only a stem or two are infected. Using a high pressure jet of water will wash them off infected leaves and buds. Minimising the use of harmful general insecticides will encourage natural predators such as ladybirds and parasitic wasp. Ensuring that the plants are well watered and growing in a stress free environment will ensure optimal sap flow minimising sugar build up in the sap thus making the sap less attractive and palatable to aphids. 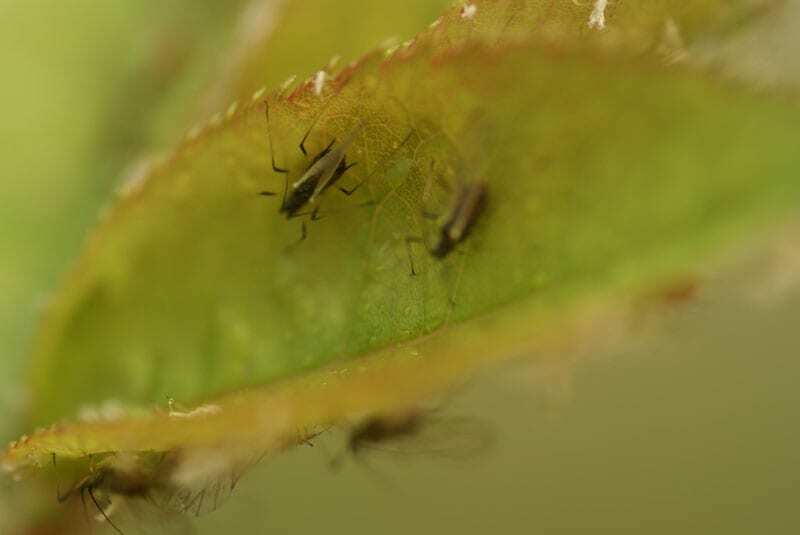 A spring drenching of a product such as Koinor or Merit (active ingredient: imidacloprid) will control aphids populations for much of the summer months. Use 2ml in 1 litre of water and pour around the base of a rose bush that is in production of new red growth. Spray infected new growth with Ludwig’s Organic Insect Spray. A fortnightly spraying programme will help prevent future infestations. Use 5ml in 1 litre of water. Rose Protector (5ml in 1 litre) will control aphids as well as Black Spot and Powdery Mildew.